Brilliant news! 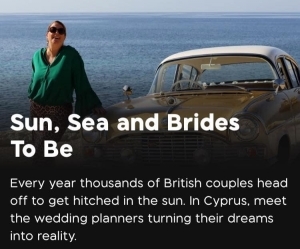 We’ve had confirmation that Sun, Sea and Brides To Be will start transmitting Saturday 26th January on Channel 4 at 3.30pm and weekly after that (subject to any C4 schedule changes). Its all about couples coming over to Cyprus and the wedding planners that plan their big days. I am on SHOWS 6, 10, 12, 16 and 20. In one way dreading watching myself, but exciting to be featured as a planner on this tv show. It was lots of fun filming, who knows maybe there will be a series 2. Next Next post: Thank You For Our Perfect day!